Just in time for those short, cold days, when almost everyone needs a little lift, the southside of town has sprouted a sweet little drive through caffeine refueling station. Barely Awake, opened on Oct. 1 in the parking lot of Behr’s Conoco, on the corner of Farm to Market Rd. and Hwy 2. Manager, Keeli Anderson is excited and full of plans. Besides a full menu of coffee drinks, they have breakfast “Bearitos,” for only $2.50, full of eggy goodness, and your choice of sausage, bacon or chorizo, fresh and hot. “Eventually we will be offering paninis and deli sandwiches, and, for hunting season, we are making up some sweet and nourishing sack lunches with two sandwiches, a cookie, chips and a drink, all for only $6.95,” Anderson told The Montanian. They are presently using both our local, fresh roasted Camp Creek Coffee, and some from Treasure State, while waiting for Ted at Camp Creek to perfect an espresso blend just for them. If you are an energy drink fan, you have to try their “Maulers,” Italian sodas kicked up a couple notches with energy drinks. 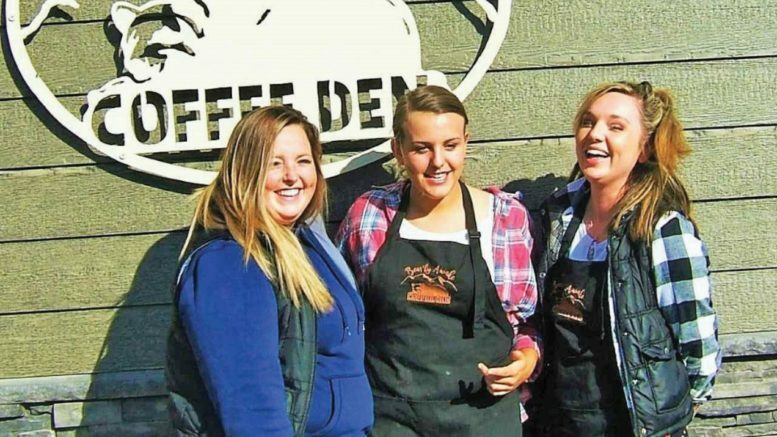 The coffee crew at Bearly Awake; Kaleigh Bennett, Lacy Anderson, and Amber Winter. Photo by Moira Blazi, The Montanian.